Island Essentials - A Linen & Leisure Supply Co.
For many years our inviting beaches have been making vacation dreams come true. 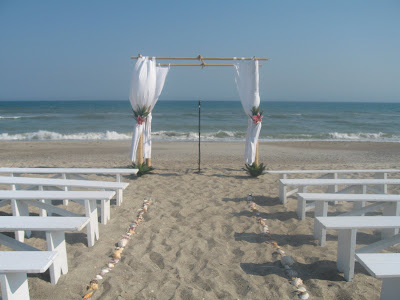 Wedding and Family reunions now bring generations closer together on beaches all across America. The Crystal Coast* in North Carolina has been fortunate to have families and newly engaged couples plan their special events in our area. Island Essentials is pleased to announce the newest addition to our Leisure Supplies - Essential Tent and event Rentals. “Let us put the Leisure back into your most important day!” We have everything you need to make your most important day leisurely. Whether it’s your wedding day, renewing your vows, your annual family reunion or a corporate retreat our event specialists and online reservation system makes reserving your party rentals quick and easy. *The Crystal Coast including all areas of Bogue Banks (Atlantic Beach, Pine Knoll Shores, Salter Path, Indian Beach and Emerald Isle), Beaufort, Morehead City, Newport, Cape Carteret, Cedar Point and Swansboro. We are also proud to be one of the few companies, in the equipment rental industry, that accepts online reservations. Look us up today!